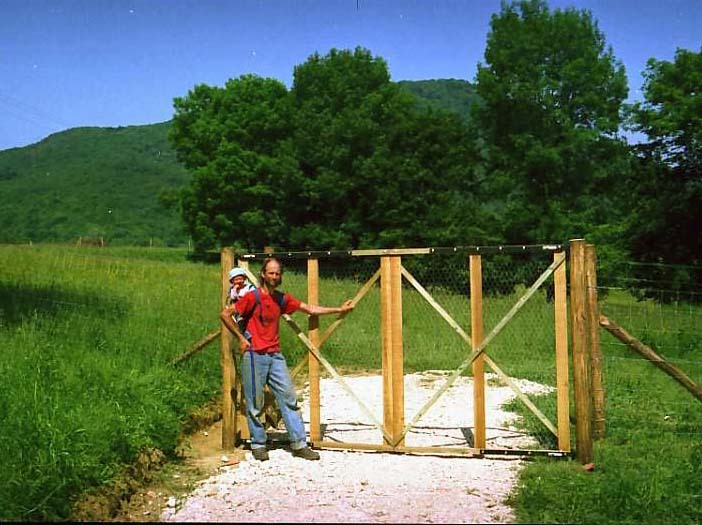 The erection of this gate was the last stage in creation of a deer fence which surrounds our nursery fields. It was constructed with acacia wood, high tensile wire, stock fencing and Gripples. The straining posts were sunk to a depth of 1m and jointed into the brace-struts. Intermediate posts were sunk with the aid of post-hammer suspended from a 3.5m tripod. This is an overhead view of siloes for the hen food; three chambers each hold up to 750kg of wheat, maize or field beans. Careful calculations were necessary to achieve this while making the best of available space. Chambers have a sloping floor lined with polyester sheeting which helps the slide. 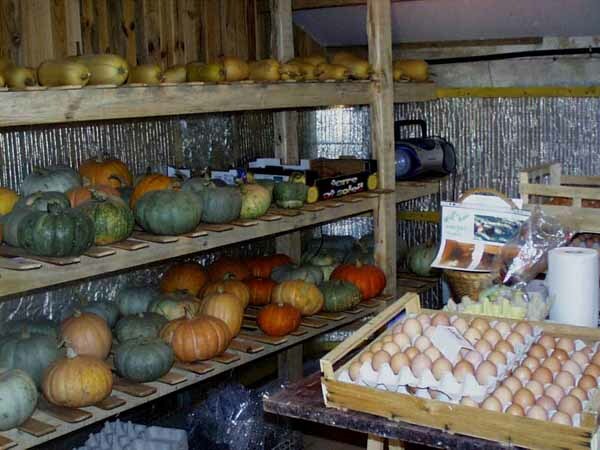 This is a view into the egg storage room, situated within the porcherie. It dampens temperature fluctuations by virtue of insulation; a thermostat controlled heater protects against frost. 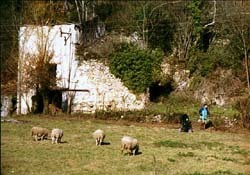 Raw sheepswool was used in the walls. 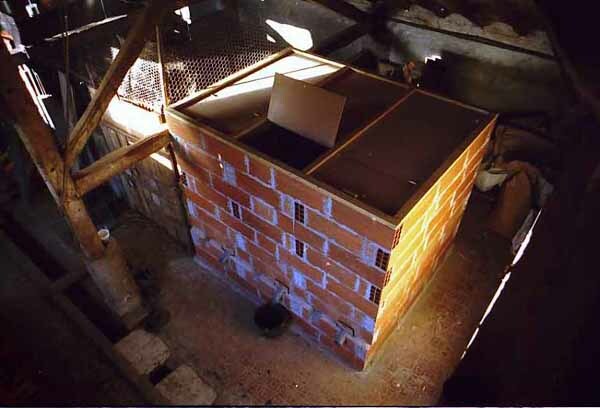 For the output of our small flock, it was an expensive item but storage of vegetable produce yields better value. 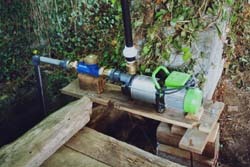 This pump is the heart of our irrigation system for the nursery beds. It lifts water through only 15m height, but pushes it through a distance of nearly 100m. 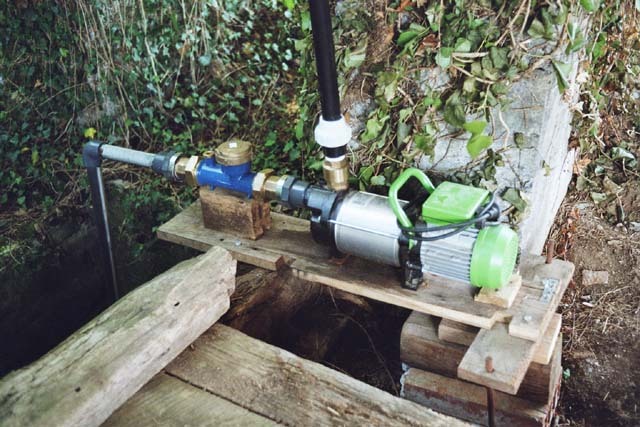 A good flow rate is acheived by use of 40mm diameter pipe, which is suspended in the trees to save on earthworks. The acquisition of the blue water meter delayed completion; at over 200Euros, we were reluctant to spend, but it is a legal requirement as we are limited to 1000m³ per annum. Many of our plants germinate under the protection of these coldframes. 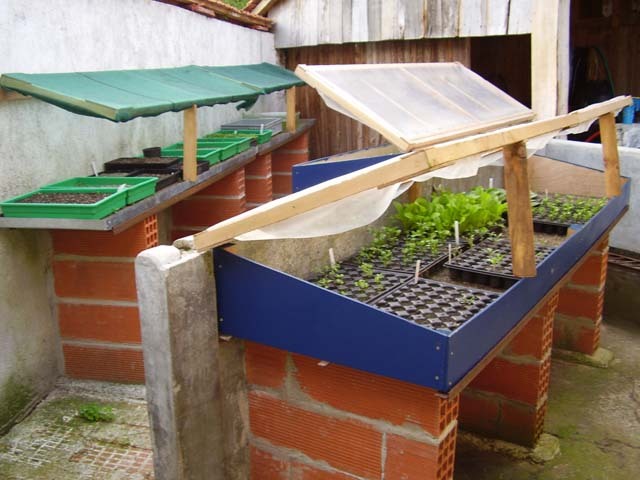 They sit in an oddly shaped corner of the yard, which could not be used for much else, but here enclosing walls protect from wind, and trapped heat is valuable for young plants. The old pigsty building has ample space for perhaps 200 hens, but hens prefer not to forage too far from home, so ground in near proximity was over-used. The mobile hen-house places our third group of 50 hens out on the field where there is ample space to forage. 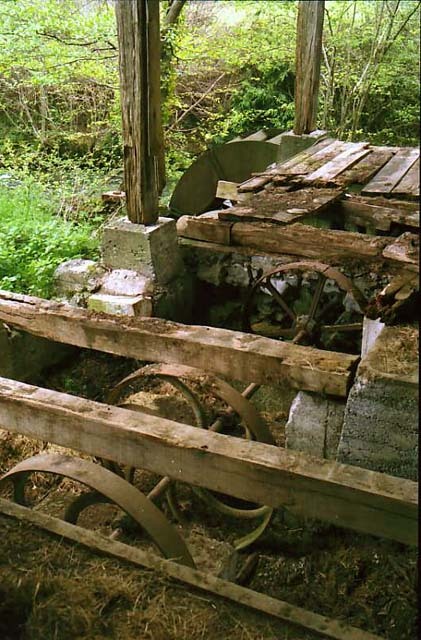 It was created with wood from local sawmills and insulated with sheepswool. Tower House (KLP) Internal all year wet Finishing of plaster/paint. Shelf-systems. Bathroom door. Tower House (KLP) External all year dry Dry-stone walling and steps. Gardening in the 'hazel-nut room'. 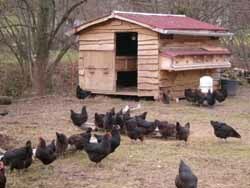 Hen care daily dry/wet Collect eggs, box up, put food out, spread sawdust, muck out. Market gardening all year cool/damp Sustain field production. 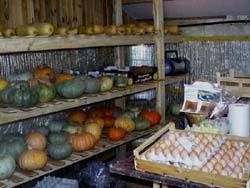 Squash, beans, potatoes, sweetcorn, leeks, carrots, peppers and beetroots established. Pursue tomatoes, aubergines, melons etc. Potting up spring dry/wet Products for veg garden & tree nursery. From plug trays or open trays. Building maintenace winter dry Repair roofs and install protection. 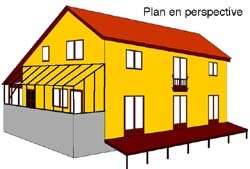 Camping a la Ferme all year dry Prepare campsite facilities: plant shade trees, create washblock/toilet. Develop willow production all year dry Weed and cut willows. Make baskets. Research alternate uses. We like our present home but its a veritable shoebox by western standards; so, it will be a great relief to move into something more spacious. 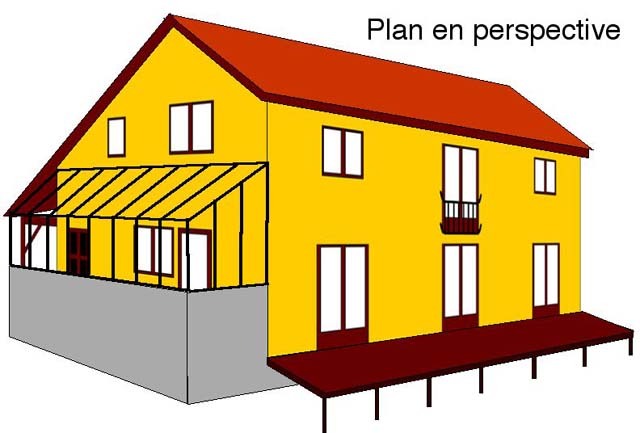 This plan was concieved before we ever purchased the site, and also before permission to renovate the ruin was obtained. 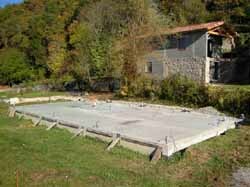 The current design is for sheet cladding upon a traditional post and beam frame of saltbox form. When we first arrived here, this building still had a roof, of sorts. It all came crashing down one day, fortunately when there was no-one around. Its future was in doubt for some time, but it finally got the green light. The heavy work was done by a team of builders with machines, which just leaves us to install floors, insulated wall systems, plumbing, wiring and a wood-burning stove. We envisage its use as an annexe to the main house. 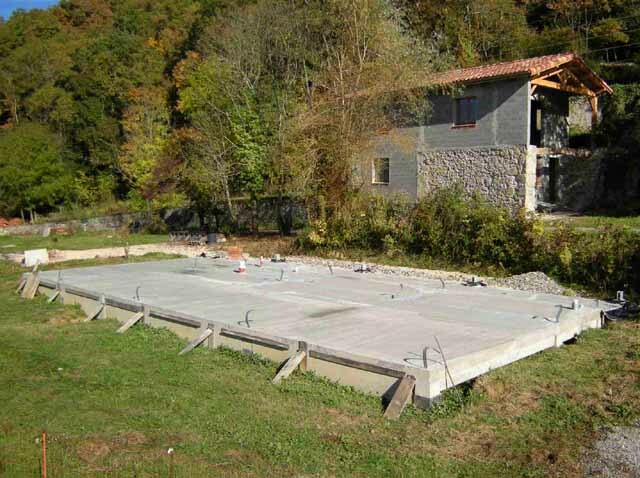 This photo of autumn 2008 shows the progress on the ruin renovation, and the foundation slab for the new house; yes, we've got two construction projects. Property development was never considered a primary goal, but that is now our opportunity so we'll be constructing for some years to come. Not a very high priority at present, sadly. The water wheel and associated drive wheels once powered a sawmill. River level behind the dam backs up by up to 200m, so theres no shortage of water, but renovation and installation of efficient generating equipment will require substantial investment of time and money.